Will your horse drink the water you give him? Horse owners tend to be most concerned about water during the summer months. Some forget the importance of keeping it clean. Colic can become a big problem in the winter if a horse does not have constant access to water. Just because there’s no concern for algae, doesn’t mean your trough, bucket or automatic systems stay inviting. Ice forms, critters can fall in and die and, of course, there’s always that pasture pet that delights in the sound of manure splashing into a water source. We consider ways to ensure a horse will drink new water while on the road, but don’t always pay attention to ensure safe water intake at home. There are so many problems that can arise from contaminated water being ingested or, sometimes worse, not. One of the benefits of being involved in an equine community on Google+ is the scores of people sharing useful resources. +Anita Lequoia pointed to this video from the Gluck Equine Research Center in Kentucky. It’s a bit long at 7 minutes, but Dr. Roberta Dwyer does a good job of reminding even seasoned horse handlers about things to think about when making water containers safe. 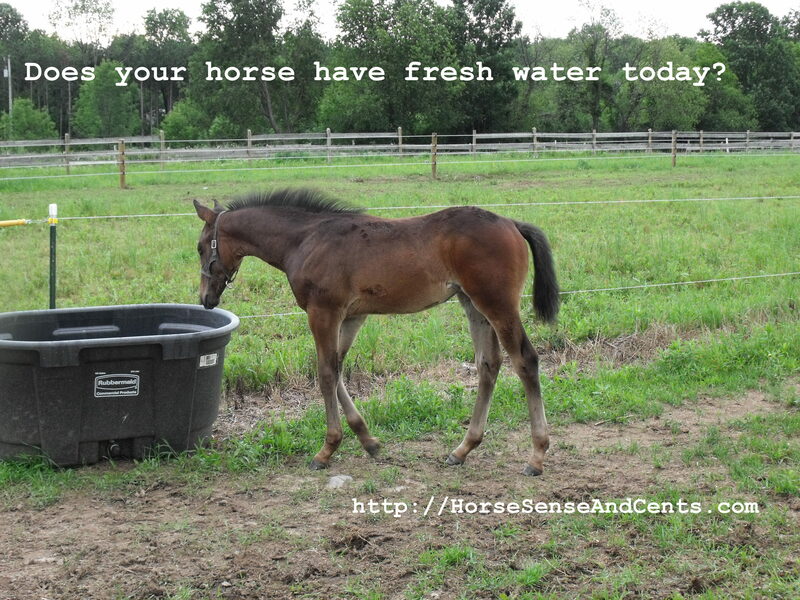 Do you check your horse’s water throughout the day? Do you pay attention to where you dump disinfected tubs (guilty here of not always thinking that one through)? Do you have tips that have worked well for you in keeping horse water clean? Please share in the comments below. « Are you listening to what your alpha horse is trying to tell you? 1 Comment on Will your horse drink the water you give him?